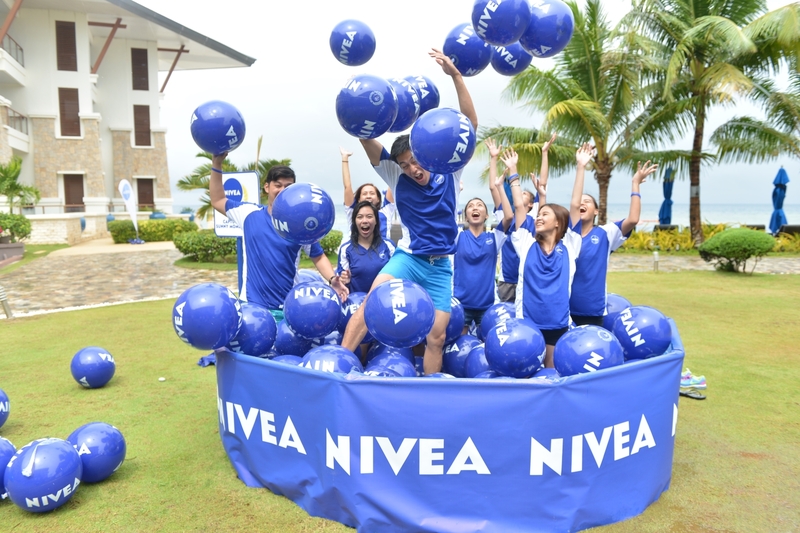 Nivea Sun Summer Kick-off: Day 2! Bohol Adventure with Nivea Sun Day 2! We had breakfast at around 6:00 AM and after that we all geared up in our Nivea Sun shirts and brought along our waterproof Nivea bag (I love this bag so much! Can't wait to use it on my next beach trip!♥) + my Nivea Sun Protect & Moisture with SPF 50 that comes in a small tube, so it's easy to travel with. Just toss it in your bag! You always have to be prepared! At around 7:00 AM, we boarded our bus to go to our water activity that was held at the Bohol Beach Club. It was gloomy when we got there and started raining at first, but you can't deny that the beach is just gorgeous! Presenting my awesome Nivea teammates - Christian Busby, Manica Tiglao, Karl Presentacion, and Seph Garcia and Joanna Robles. We also have two other girls, but I couldn't find them at the time this was taken. :( But so glad to be group mates with these hardworking people! 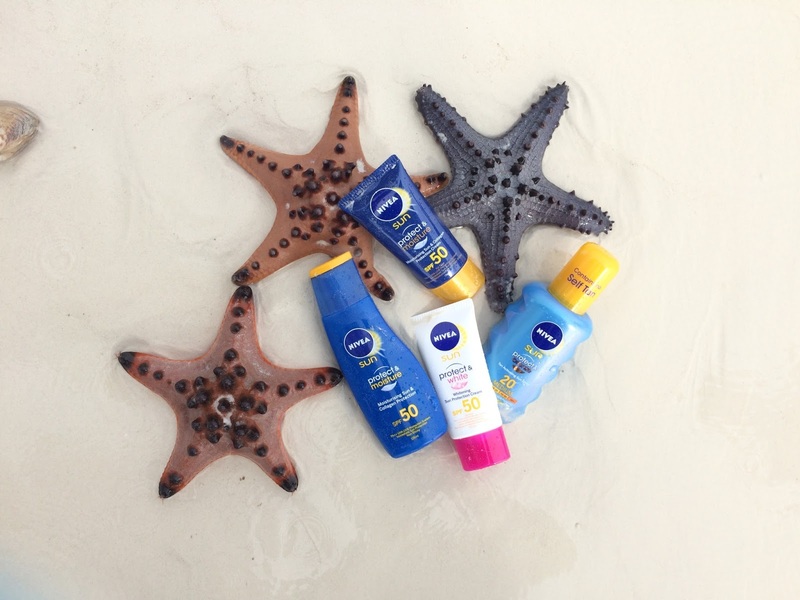 Whether cloudy or sunny, we all enjoyed our water activities with the protection of NIVEA Sun! :) No to harmful UV rays! If you're the type who's afraid to get dark, you can now play under the sun confidently without worrying of skin darkening with the NIVEA Sun Protect & White range. With its Active Whitening Complex, these products help reduce skin pigmentation and melanin production to effectively lighten the skin and prevent uneven skin tone. Have fun under the sun!!! ^_^ Wuhooooo!! It was nice that even if we couldn't use the WaterBee during the Water games, we actually were still able to play around with it. They just had to bring it to the middle of the sea where the water was much higher. :) Had so much fun paddling with Janice of Mommy Mundo! Basking under the palm trees! I can do this everyday! Spotted quite a few starfish. The beach was filled with different kinds! But this was my favorite from the lot! :) And the water at The Bohol Beach Club is so clear! This picture doesn't even look like the starfish is submerged in water. It's as if it's just sitting on rocks outside of water, right?? After almost three hours at The Bohol Beach club, we all headed back to Bellevue Hotel for yet another activity! But i'll save that for another post! This is quite long already. :) Day 2 part 2 soon! Same here! Nivea is my go-to sunblock! :) Hope you'll have a great summer vacation!